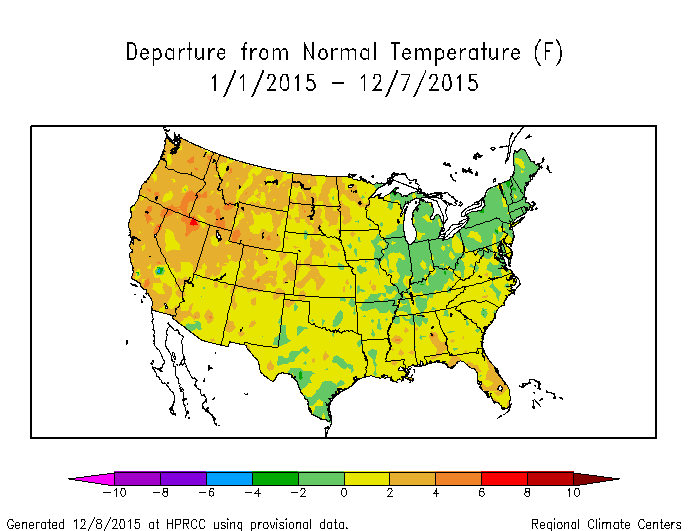 Even though we still have a few weeks to go, we are now entering the home stretch for the year in climate. 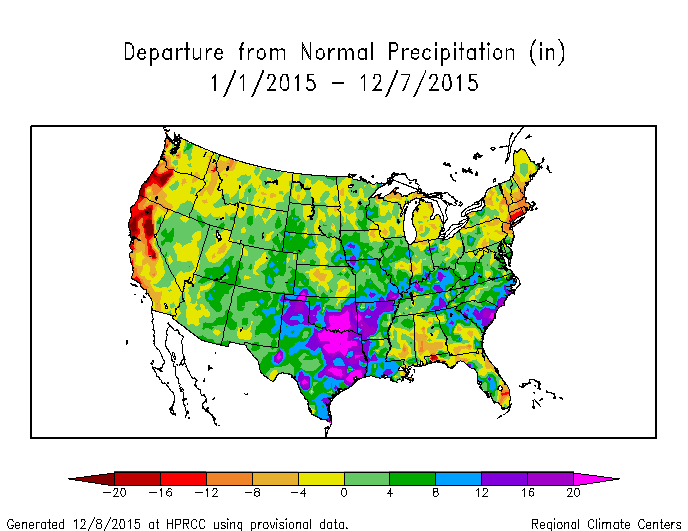 Here are some images which capture what we expect for the 2015 summary, barring any last minute extremes in weather. The maps below show the year to date temperature and precipitation departures for the US from the High Plains Regional Climate Center. 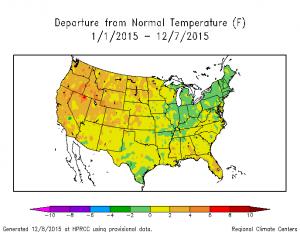 Note that most of the United States is above the long-term average temperature. 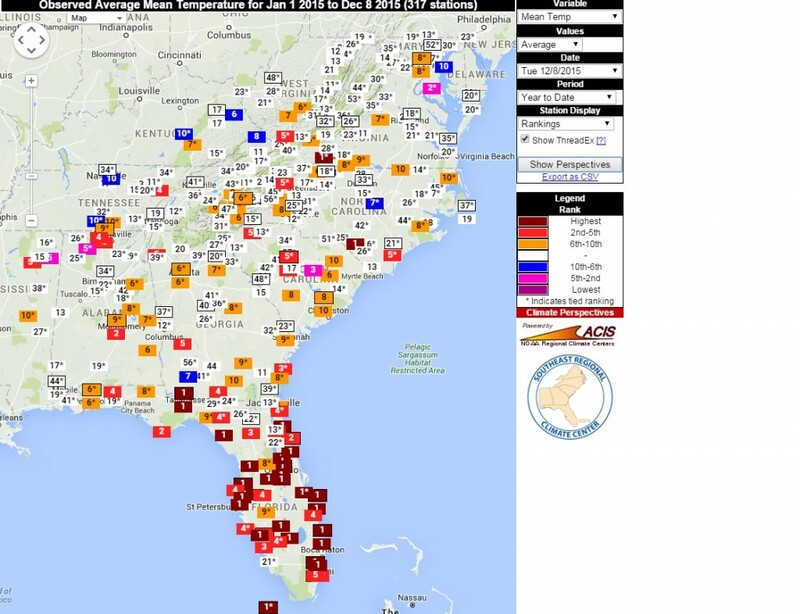 In the Southeast, Florida is the most above normal. 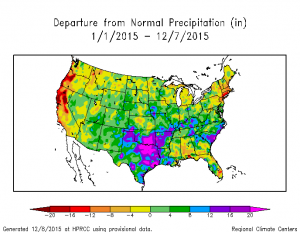 Precipitation varies widely across the country and the region, with the floods in South Carolina and the southern Plains and the continuing drought on the West Coast. In the Southeast, South Carolina was dominated by the October floods in spite of drought conditions earlier in the year, and Alabama, southern Georgia and parts of Florida were much drier than normal. 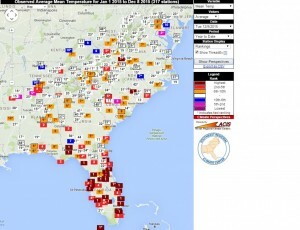 The ranking maps from the Southeast Regional Climate Center’s Perspectives tool show that Florida is likely to be close to the warmest on record for 2015 based on the individual station rankings. Charleston and other areas in eastern South Carolina are likely to set their wettest years on record with many other nearby stations in the top five years on record.